The Amish Pine Hoosier Hutch Cupboard is full of storage options and cute country style. The final look is yours to choose from a variety of finish options that can create just the perfect look for your kitchen or dining room. The Pine Hoosier Hutch Cupboard is not only gorgeous and strong and wood furniture that will become a family keepsake, but it's fun to use! 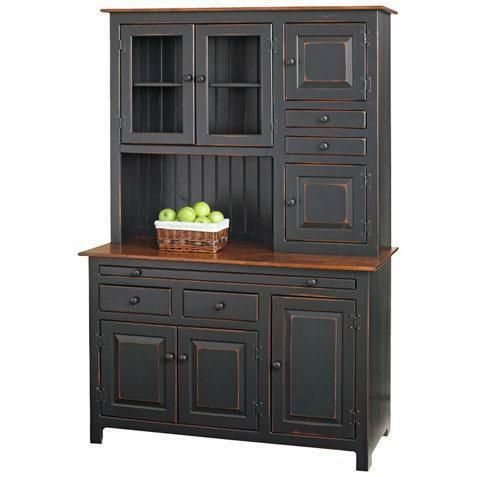 The Amish Pine Hoosier Hutch Cupboard is built by hand at an Amish wood shop in Pennsylvania. It's solid pine wood and comes at a lower price than other solid hardwoods. Pine is softer yet strong and embraces the cozy country look. Pine wood can easily show off a painted finish which not all hardwoods can do. It is a prime candidate for distressed finishes as well, so you can create an antique look if you wish. DutchCrafters offers quality solid wood hutches in all styles. They can be customized with different dimensions, finish colors, wood types and more. Don't hesitate to call an Amish Furniture Specialist to chat about exactly what you're looking for in a wood hutch. They are happy to guide you right to what you're wishing for. Thank you for shopping DutchCrafters solid wood hutches. Depth to Edge of Hutch: 10"
Depth to Edge of Buffet Bottom: 19 1/2"
Just wanted to let you know that we are pleased with the Amish Pine Hoosier Hutch Cupboard and to thank you for all your assistance. Our food processor and mixer fit perfectly. The Hoosier Hutch showed up today. We absolutely love it. It was a complete pleasure doing business with you. Have a Happy Holiday and thank you once again.